Use this guide to create a Customer Group. The group will be notified in the event of an outage and after the resolution of an outage using a Group Email. In the menu, click on Groups & Schedules. Click on the Contact Methods tab. Click Add Contact Method so AlertOps knows how to contact the group. Click on Escalation Rules in the menu bar. Select an existing Escalation Rule. Click Clone Escalation Rule in the upper right-hand corner. Enter a unique Escalation Rule Name and give it a description. Select the Recipients tab and add the Customers Group. You can also add individual Users here. Hover over Administration in the menu bar and click Topics. Click Add Topic, enter a Topic Name, and click Save. In the menu, click on Workflows and then click Add Workflow. This Workflow will be triggered when an alert is Opened. 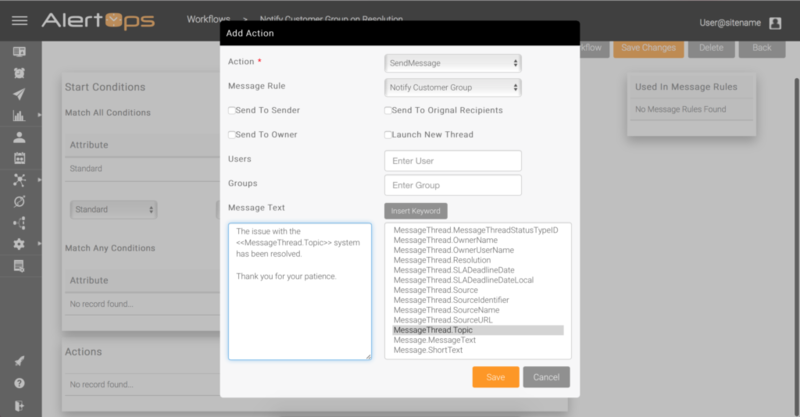 Set the Workflow Type to MessageThread. Set the Template to Standard Alert. Add a Topic Start Condition. This will provide an additional filter to only fire the Workflow when the Topic is a match. Add a Message Thread Status Start Condition. This determines which event will trigger the Workflow Action. Add a workflow action. Select SendMessage from the Action dropdown menu. Enter some message text. You can insert any fields from the alert thread, including custom Template fields. In this example we are inserting the Topic. In the menu, click on Workflows and then select Add Workflow. This Workflow will be triggered when an alert is Opened. Set the Workflow Type to Message Thread. Click Escalation Rules in the menu bar. 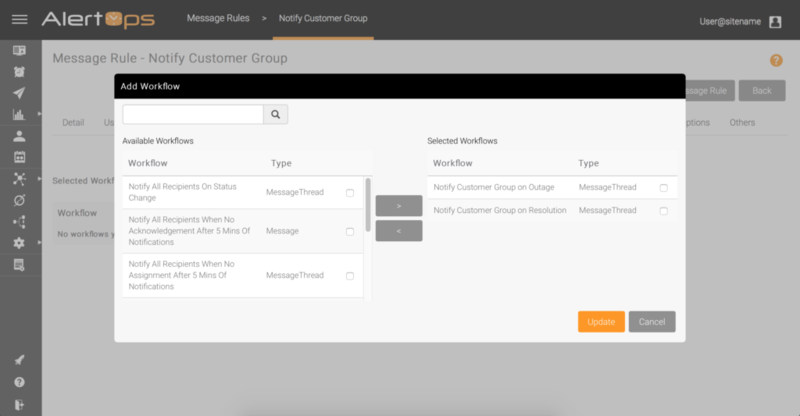 Select the Notify Customer Group Escalation Rule. Make sure both Workflows you previously made have been enabled. Then, click the Workflows tab and add both of the Workflows.